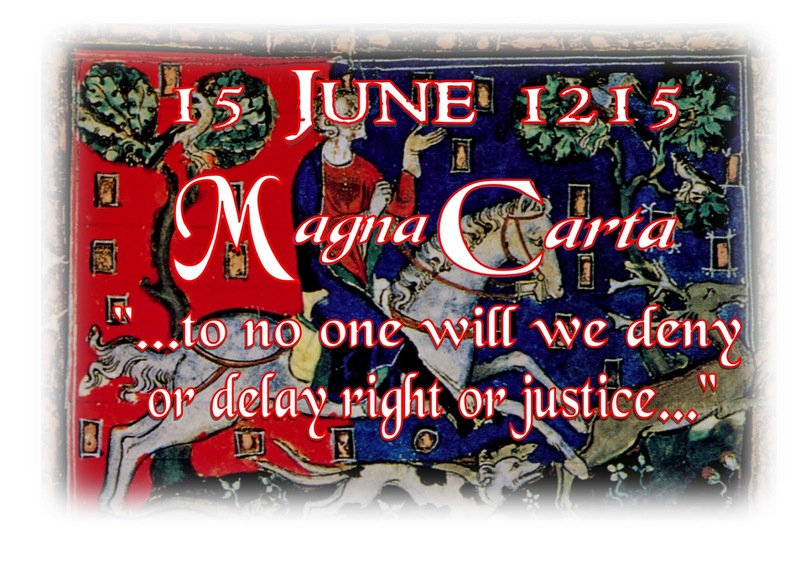 Back in the day when I was a gangling nine-year-old, with a mass of freckles and the ubiquitous large bow in my hair, we had a Magna Carta Day at school. We were all so excited at the prospect of this. It was 15th June, 1956, a Friday it was, and we were allowed to wear our best clothes for the occasion. We were lucky in having a teacher who had the knack of making every lesson interesting. Thinking back, I am sure she could have made the telephone directory interesting. She would just sit on the corner of her desk, and, well, just teach. Time flew in her class. Teachers like that are a gift to a child. She was my gift, and she nurtured my love of history. I will never forget her. 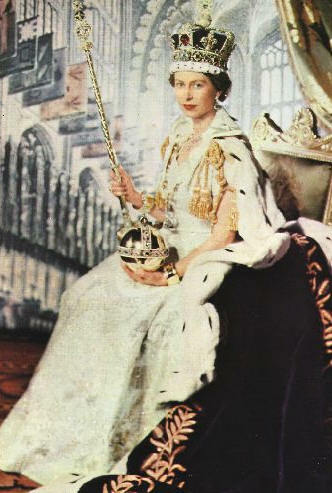 So, to continue; there hadn't been much to celebrate since WWII had ended, save for the coronation of Queen Elizabeth II in 1953, and another landmark of 1953 for us children was the end of sugar rationing. 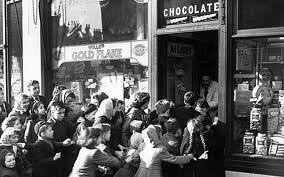 We formed endless queues outside the sweet shop to buy our humbugs, barley sugars, and gobstoppers. Just don't get me started on gobstoppers with a different colour for each layer.... Sorry, I digress... Magna Carta. We were all excited when our teacher told us of the poem that we would all learn. 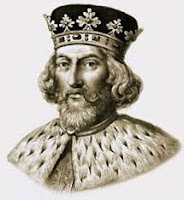 It was simply called 'King John', by Hugh Chestermann (b. 20.03.1884 - d. 03.11.1941). It can be found in Brian Moses' anthology Blood and Roses: British History in Poetry, which was published by Hodder Children's Books in 2004. We were given it as a print-out. The teacher put the copies on the front desk, and asked us to take a copy and pass the rest back. This we did, until we each had our own. We were a class in excess of 45 children, being 'baby-boomers'. We were informed that we would be reciting it as a 'round', where one child would recite the first two lines, then the next child, the next two lines, and so on. That is why it would be done as a 'round'. By the time it had been recited many times, it stuck in my head. Over the years, however, I have only remembered the first four lines, but on seeing it again, it all came back to me. Followed the road to Runnymede. To poor perplexed King John that day. "It's easily done and it's all we want." "A J and an O and an N" said Hugo, Baron of Harpenden. "Oblige Lord King with your signature." A mere formality," laughed de Bere. "A stroke of the pen and the thing is done,"
Murmured Sir Roger of Trumpington. "Done in a twinkling," sniffed de Guise. Said Stephen Langton, "Sign if you please!" I can't help feeling sorry for John. We have no cause to pity John. I think it is safe to say, that whichever ending of this poem you prefer, there has never again been a king named John. 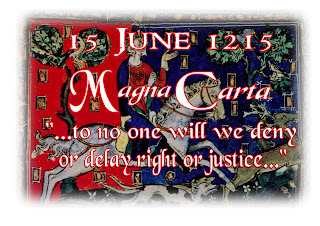 I am sure that my continued love of history stemmed from my teacher's enthusiasm for our Magna Carta Day. It conjured up in my mind all the colourful costumes, and the striped tents with their pennants flying in the breeze. I had seen Quo Vadis and Knights of the Round Table at the cinema, starring Robert Taylor, and it was those Hollywood images that were in my mind.